Think of this scenario. Your family or friend is getting married and you just cannot figure what to gift them. You opt to buy them a coffee maker. Unfortunately, three other people attending the wedding thought about the same gift and your friend has three coffee makers. Think of this other scenario. You are a corporate looking to gift your best employees or best clients with tokens of appreciation in form of gift vouchers. However, you have no idea what to gift them. Sure Gifts, a Nigerian startup is looking to change this in the Kenyan market. Suregift offers users two options; generic card loaded with amount which once gifted, the user can redeem for a gift they like so long as a merchant is signed up to Sure Gift. You also have the option of specifying the gift such as clothes, electronic devices, load it with cash and have the user redeem the amount for a gift they like. Launched in Nigeria by Ex-Jumia employees, Sure Gift is looking to change the gifting culture in Africa through using technology. The product launched in Kenya in October 2015 and has since signed partnerships with Cake City, Vivo Active wear, Siri Delights, Imax, Sky Dive Diani, Jumia among others. “We want to change the way individuals and corporates In Kenya gift. This is new concept to this market but the market response has been encouraging so far”, says James Okoth, Retail and Sales manager for SureGift. A user visits the sure gift website. They then pick a merchant or can opt to get a generic sure gift card option usable in any of the stores avaulable. They then select the amount they want to load the card or opt to set their own amounts. One can also choose to personalize a card with a message or a video such as Happy Birthday or Congrats on your wedding. They then choose the mode of delivery from email, home delivery or phone and proceed to checkout. This option means the recipient can opt to shop at any of the merchants enlisted by Sure Gift. The other option allows the user to order gift cards for specific merchants. Assume I want to gift a friend with a movie experience at Imax, I will need to go to the website, select the iMax tab, order the card for the various amounts specified, specify the mode of delivery and the friend can then watch the movie. The cards offered have a validity period of 1 year with users able to load cash on them via PayPal, M-Pesa, Card and Airtel Money. Sure Gift cards can be used by both corporate organizations and consumers. Consumers will find the product particularly useful for weddings, birthdays and even parties. Corporate clients on the other hand will find the idea useful for employee incentives roll out corporate social responsibility and importantly use it for consumer gifting. Sure gift cards also allow for the swapping of vouchers. Assuming a gift card belonged to a merchant whose product you are not interested in. You can opt to swap it with that of a different merchant whose product gift you would like to own. Sure gift also allows you to merge your gift vouchers into one. If you have a gift voucher worth Kshs. 3,000 and another worth Kshs. 2,000, you can merge the two into one and use them to purchase a product worth Kshs. 5,000. It further offers the ability to top up and still make a purchase in merchant stores that accept Sure Gift. I have a voucher worth Kshs. 3,000 and would like to purchase a shoe worth Kshs. 4,000 sure gift gives me the ability to top up the 1,000 bob in cash and make the purchase. Redeeming of the gift cards takes place through the merchant side of the app, online or through the POS when checking out purchases made. I think its a brilliant idea. My only trouble with it is the inability to re-use a card once you collect your gift with the vendor. Those are way too many cards. However, the generic card however sort of takes care of this problem. 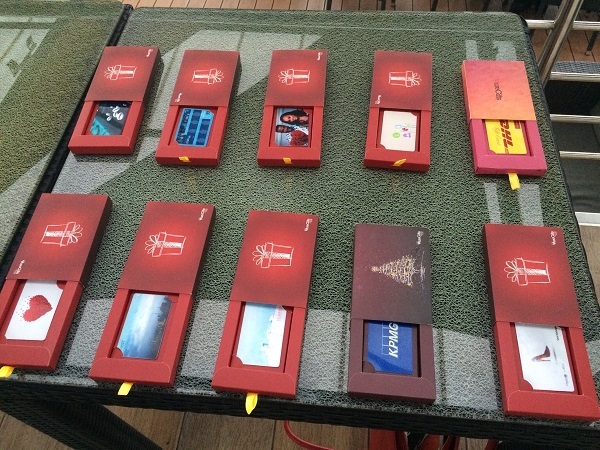 James says each gift card comes with its own unique voucher code meaning re-using a card is not possible, as each card is tailor made for a specific task or occasion. “We are delivering the gift card solution on different platforms including mobile and egifts meaning you do not need a physical card every time you receive a gift”, he said. I also asked James if he thinks Sure Gift will win as this product proposes a change in the way we gift entirely. “Definitely. What we are offering is not just value but a solution that actually works. This will allow many people to get creative in the way they gift others”, he said.